Hello everybody! Last month sure flew past. All of a sudden it was time for yet another SRC reveal. Don't know what SRC is - well, its only the coolest foodie club around. We are a group of bloggers who come together each month for what we call an SRC reveal. Each month we are assigned a blog from the group and we pick out one recipe from the assigned blog, make it ourselves and post about it on reveal day. The only catch it, you cannot disclose which blog you've been assigned till the reveal day. Its so much fun. I've been a part of this fun group for a while now, and it is so much fun. If you'd like to join, you can find more details here. This month, I was assigned Beth's blog - It's Good to be the Cook What a fun name for a blog! Not surprising, since Beth sounds like a fun girl too. She cooks up some serious yum and strongly believes in eating healthy and exercising. She loves her sports and a 100% dog person (that's what she calls herself). I totally get that - I'm a 100% dog person all the way. I totally fell in love with Stella May, her really adorable little dog. Go on over and say hi to Beth and Stella, will you! For this months reveal, I had quite a few options. What I really love about Beth's food is that apart from being healthy, it is also no fuss and big on the flavors - something I look for in food. I narrowed my options down to this Italian Hoagie Dip, Beth's Springtime Tuna Salad, Sriracha White Bean Dip and this Onion, Tomato, Spinach Scramble. There's plenty more great recipes on Beth's blog, so make sure you stop by. I decided to go with the Onion, tomato, spinach scramble. The weather in Sydney has cooled down considerably and there's nothing better than starting the day with a nice hot brekkie. This is the perfect option for a nice weekend breakfast. I've made a lot of omelettes in my lifetime, but this one was different. You saute the onion and tomato before adding the egg, and this intensifies the flavors and makes it extra yum. That coupled with the baby spinach stuffed in it results in something stunning. Pretty and colorful to look at and so tasty, not forgetting your getting some greens in as well. This one is simple but hits the spot. If you have trouble getting the little folk in your house to eat up their greens, this is an ideal way to get some in their diet. The spinach doesn't alter the taste of the omelette, but it adds all of its goodness to their diet. Here's the spinach, before you can flip half the omelette over the other side. Add the onion and chilly (if using) and saute till the onions soften up a bit. Add the tomato and stir fry for a minute. Season with salt and pepper. Add the beaten egg and let it set on one side. Place the spinach on one half of the omelette. Carefully, flip the vacant half of the omelette over the other side. Let it cook through. Flip over and let it cook on the other side too. Serve hot with some toast and a nice hot cup of coffee. Yum! 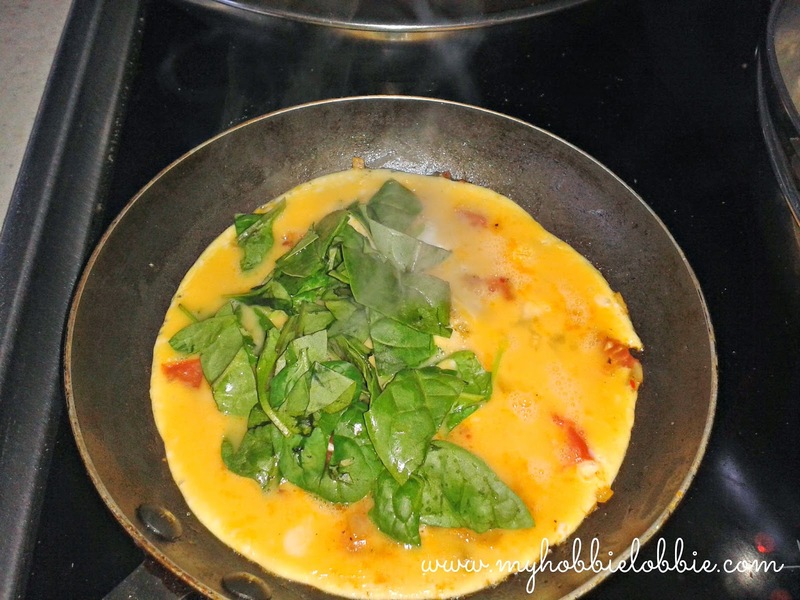 I love greens in omelettes...a great SRC pick! 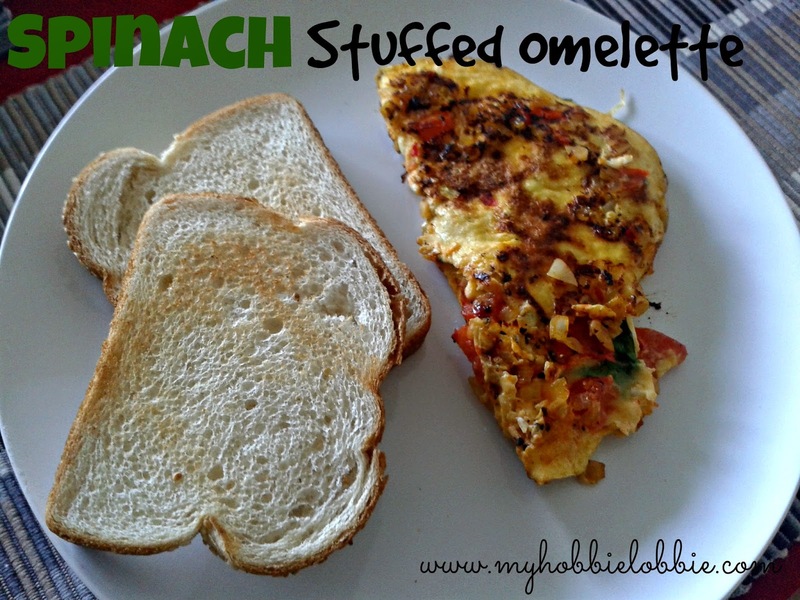 I love putting spinach in my omelettes!! Happy to say I do too :) Thanks for stopping by Renee! My family loves egg dishes for dinner; I'll definitely have to try this one out on them. Awesome pick! i love omelettes! yours looks fabulous. great choice for src! 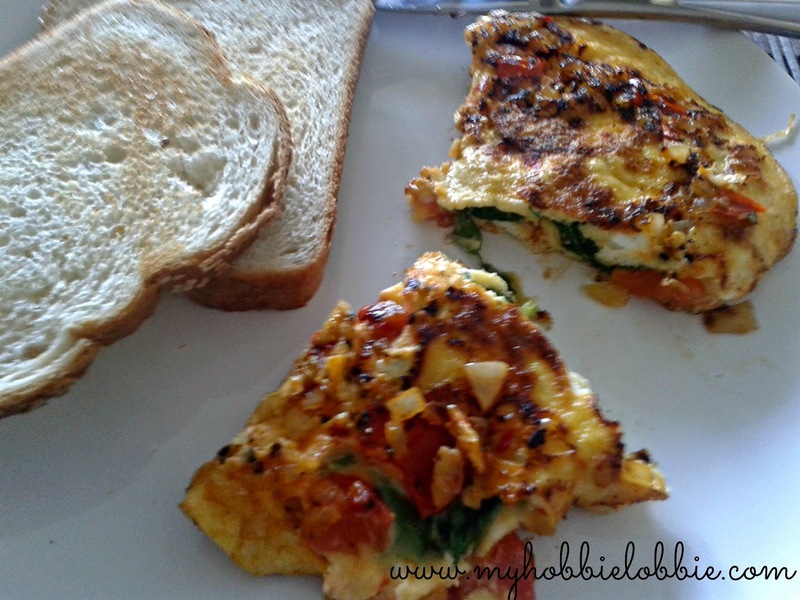 How good are omelettes - seriously! Love the sound of this one! Thanks ... Sometimes nothing else will do!